One of the easiest and most refreshing summers treats, next to the popsicle of course, is the snow cone. Perfect for this heat wave we’ve been having. In Dominican Republic we call them frio frio, which just translates to “cold, cold”. I always imagined someone getting a really bad brain freeze and yelling “ay frio! frio!” and the name just stuck. Ha! Well like the snow cone, the ice is shaved first and some juice concoction is poured over it. I made this one like a granita, oh so very Italian of me, a tribute to one of my other favorite places, where everything is mixed first and then frozen and scraped with a fork to form ice crystals. I have to tell you, when I made this I used way too much ghost pepper because I yelled out HOT DAMN! …instead of frio frio. It burned good and made me pucker but part of why I started this spicy food blog was because I actually enjoy this. I’m not talking about any pain and suffering here just a good flavored burn that releases some wonderful endorphins for me. I’m not saying you HAVE to enjoy this, but its good to test your limits and see what you can tolerate. If you don’t like the flavor, adjust it. It’s really about what works for you since everyone’s palate is different so taste, taste, taste your food. 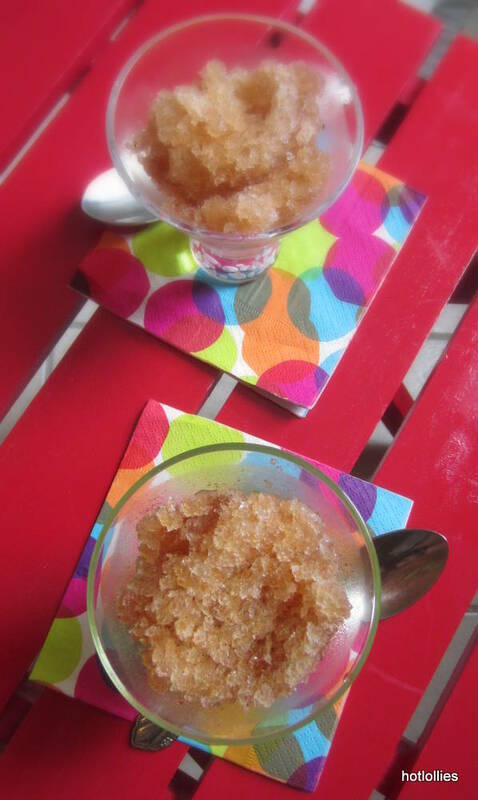 The ghost pepper does give the granita a nice flavor. It is similar to the habanero’s citrus flavor but 3-4 times hotter and should be used in moderation and handled carefully. So baby steps folks and seriously, take it easy with ghost peppers and use gloves when handling…and please, do not rub your eyes!! I’ve done this with milder peppers and it’s not pretty. Those angry peppers are not to be messed with because you will be sorry. Last year it was knocked out of first place for being the hottest chile in the world and now second to the Trinidad Moruga Scorpion pepper but that doesn’t mean it’s lost it’s heat. Now there’s just something hotter and that’s one pepper I don’t even want to touch. This recipe is the modified version but if you’re feeling lucky or adventurous then add some more slices. 1. Heat up the tamarind and the pepper in a small saucepan. Mash up the pepper with the tamarind so it breaks up well. 2. Add the water and agave syrup to sweeten. Taste mixture to make sure its sweet enough for you and has good spice level. 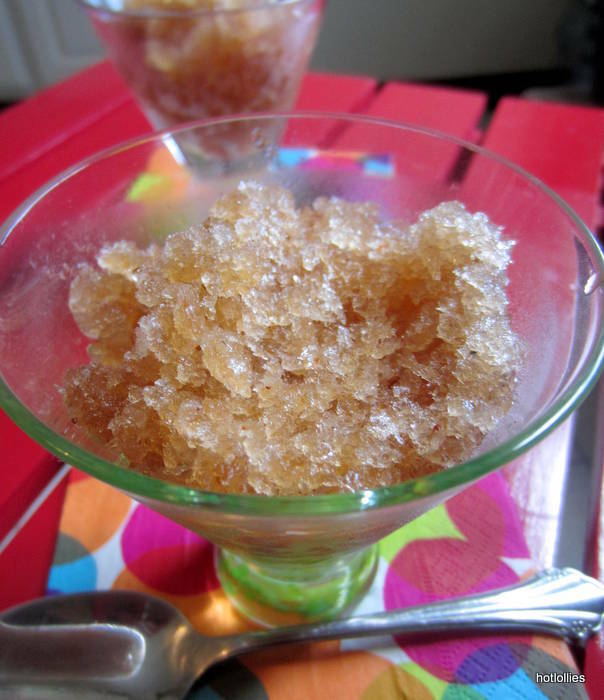 Tamarind is very sour so the sweetness of the granita should be a matter of preference. 3. Bring mixture to a boil and remove from stove to let it cool. Strain the mixture. Sometimes you’ll find pieces of seeds in tamarind pulp so make sure you get rid of those. Add the mashes up pepper back if you like. Add the mixture to a shallow dish and place in freezer for an hour. 4. Remove from freezer and scape frozen juice with fork until small crystals form. If not completely frozen, freeze for another hour or until frozen and scrape again. 5. Spoon into cups and serve.